TEN thousand brutal deaths and at least as many long-term injuries are the agonising physical measure of devastation from Nepal’s earthquakes last April and May. Another measure — that third-world nation’s paltry aid allowance — was one sack of rice and one blanket per family, yet no tents for shelter from coming monsoons and no tools or materials to rebuild homes. These disaster images rarely vary for medicos: sheared bodies, ruptured souls — little changes, bar specific case diagnoses, map coordinates and accessibility. Royal Melbourne Hospital gastroenterologist Tianhong (Hong) Wu, 28, has developed an acute disaster CV following her crucial treatment of quake survivors. Already on site for a Trek Medic fundraising trip to Mount Everest and medical camp in the Annapurna region, then a planned slower-paced scouting trip to Terai on 25 April changed everything. Dubbed Gorkha from its epicentre’s region, the 25 April quake’s injury toll is now more than 23,000, its massive magnitude of 7.9MW deeming it meteorologically violent. Total construction and landscape damage was US$5 billion, which is about 25 per cent of Nepal’s GDP. There was also substantial damage in regions of India, China and Bangladesh. The Gorkha quake was followed by another centred in Dolakha on 26 April, while the main aftershock was a major 7.3MW rupture near Everest’s base camp on 12 May that took 66 lives and injured another 1000 people. “A whirlwind of events was happening every day, every hour, every few minutes,” Dr Wu — “call me Hong” — reports, listing images confronting even for medical pros who repair shattered bodies daily. “I see beautiful girls with spinal cord injury resulting in permanent disability, and so many people with fractured, even severed limbs, all of which will need prostheses, none of which exists in Nepal. There’s no rehab there.” She looks away, averting her glorious, lava-brown eyes. Somehow, road trauma or violent assault around Melbourne seem less catastrophic with leading local treatment and rehab facilities, yet those advantages are foreign concepts during third-world disasters. A keen traveller, Hong dedicated 12 months to medical volunteering, research and travel, 2015’s three months in Nepal following four weeks there in 2014. Her Melbourne Uni medical degree followed pathogenesis and immunotherapy research studies investigating coeliac disease in a DQ2 transgenic mouse model. Those immunotherapy disciplines were severely stressed during Nepal’s crisis. “I was on the ground there by day three and even then there were many cases of PTSD (post-traumatic stress disorder),” she reports, detailing superb efficiency: “My initial plan to volunteer as a doctor wherever I could, somehow turned into leading a WHO (World Health Organisation) and Ministry of Health-registered Foreign Medical Team in one of the worst-affected districts, into scouting totally unfamiliar areas, into 100 messages, phone calls and emails each day while coordinating reinforcement Trek Medic teams from Australia. “Then there was critical collaboration with Nepalese organisations and medical teams, where it turned into meeting some of the most amazing and resilient people I will ever know, into making friends for life, into receiving help and hospitality from strangers, into sleeping in a friend’s front yard under the starry sky with his whole family and neighbourhood, into camping in the Australian Embassy, into sitting on the back of motorcycles, military trucks, utes, local buses and microbuses, into getting used to cold showers, dal bhat and camping mats. “We heard of many cases of major depression as soon as we began work, with PTSD very common. Bar alcohol, there’s no other form of personal support, no counselling or psychological help anywhere in Nepal,” she frowns. So this credited young doctor used her time and skills for victims’ survival and recovery. Australia had two medical teams in Nepal, both from RMH. “Our team was initially five, then it upped to 11,” Hong explains, crediting the aid work of Professor Fary Khan. The Professor of Rehabilitative Medicine at RMH’s Royal Park Campus in Parkville joined Hong to lead major treks into the Himalayan alps with Trek Medic trauma aid. Hong’s Trek Medic team, in collaboration with the Nepal Kidney Foundation, were recognised by WHO and Nepal Health Emergency Operation Centre (HEOC). They used a 15-bed disused hospital facility with minimal electricity and lighting to treat an average of 250 patients every five days, or 50 each day. And these weren’t just common colds: usual presentations were respiratory infections, faster-intestinal infections (Hong’s specialty), wounds, cellulitis, psychosomatic difficulties and trauma, along with chronic cases of headaches, gastritis, GORD, OA and chronic back pain. “The most serious cases included open fractures of the foot complicated by wound infection and early gas gangrene, likely rhabdomyolosis, open ulnar fractures, spinal fracture with possible cord compression, and lumbar nerve root injury, all of which required referral to a higher centre post-stabilisation of the patient. “Other clinical fractures that may require surgical management were stabilised with plaster back slabs, then referred to higher centres for X-ray. 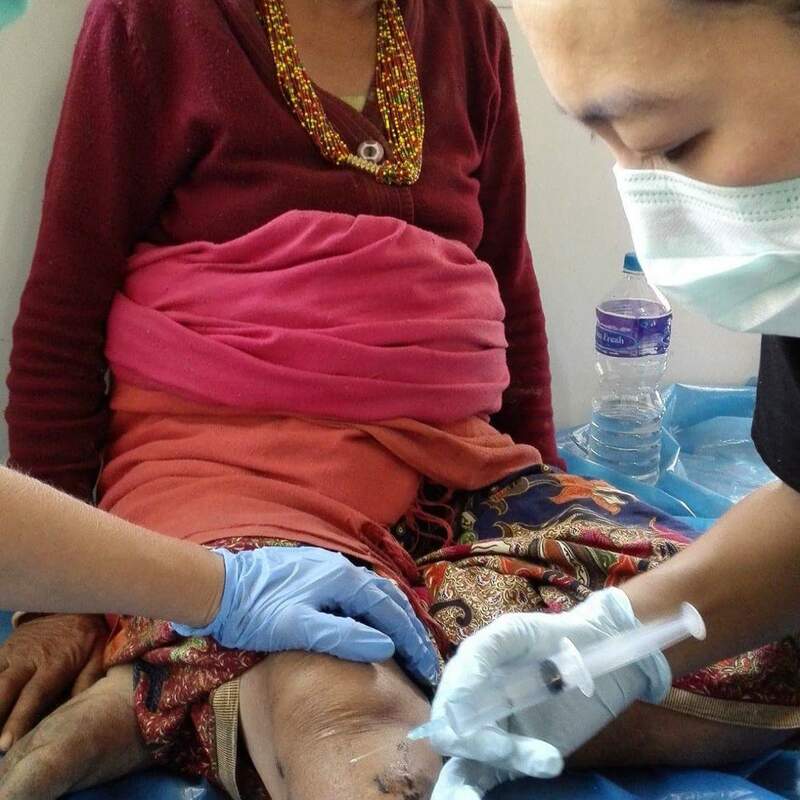 Two cases of possible TB were also detected, and a large number of people also presented with diarrhoea they caught after the quake. Three of those developed bloody diarrhoea, fever, hypertension and tachycardia, and required fluid resuscitation and IV antibiotics. The likely source of that was contaminated water due to the large number of dead livestock and rubbish in nearby villages not contained. Dr Hong says her trip became a conglomeration of the magnificence of the Himalayas, the upbeat and caring nature of locals, the devastation of the earthquakes, the sadness and suffering of the people, fear of the unknown, confusion in the chaos and the urge to help as much as possible. Yet she says the greatest hurdles were not meteorological or medical: “The hardest? Bureaucracy, by far! “The international airport was controlled for the first week by the Indian Army, who were evacuating Indian citizens only. Then private choppers were evacuating tourists, so the Nepalese were second-class citizens in their own catastrophe! “The first week completely ignored the locals, but after major lobbying (Hong takes no credit, but you can bet she was involved) the Nepalese Government provided a chopper to bring in the Canadian and Hong Kong Red Cross, who provided full field hospital capabilities. “After another week the road to Dungche was cleared and aid came in. “Time is life in these situations and the first 72 hours is critical for survival, so all those delays were really felt by our team,” she says, gritting her teeth. “Later observations recorded several hundred youngsters living in a tin hut on the outskirts of a local town. Most were orphaned from the quake, they had scabies and many, many injuries. “We opened the clinic at 8.00am seven days per week, sometimes finishing late evening, then writing reports and other critical management tasks, [because] lack of coordination usually breeds chaos,” Hong cringes. Those frustrations relieved for now, the RMH gastroenterologist is also a relief doctor for regional NSW, before returning to Nepal in 2017. “We’ll do free Trek Medic village clinics again,” she tells, hunching forward. “Arthritis and musculo-skeletal pains from wear and tear in the fields, irritated eyes and cataracts from UV light and kitchen smoke, gastritis from erratic diet and alcohol … the list is endless. “Then the usual presentations with lung degeneration, infections, diseases and miscarriages … There’s so much need for us there,” she says, donning her diagnostician’s cap. “Shortly before coming home in October we discovered a gastro outbreak in this place where displaced people were congregating. There were 500 residents and 30 new cases each day. Just like with the earthquakes, there’s a variety of conditions and variety of patients old and young,” says Trekkie Hong. Those bureaucrats don’t stand a chance with this dedicated soul. Hong enacted both medical and social care in Nepal, having adopted a small child’s life and education expenses. Founded in 2011 and based in Melbourne, Trek Medic is a non-profit team of volunteer doctors, nurses and allied health professionals. They grouped together to help provide basic health care, education and emergency aid to under-privileged communities worldwide. Following a trial expedition to Nepal in 2011, they have returned since on average twice per year, their ongoing work critically required for a nation traumatically compromised by territorial disasters, minimal medical provision and no rehabilitation facilities. Nepal’s population of nearly 30 million sees one third living below the poverty line and one quarter earning less than US$1 per day. Children aged under five are 10 times more likely to die than if they were born in Australia, while adults aged between 15 and 60 are five times more likely to die than if living here. The top three causes of death in Nepal are pneumonia, diarrhoea and measles, all preventable diseases associated with poor living conditions and lack of access to sanitation and basic health care. 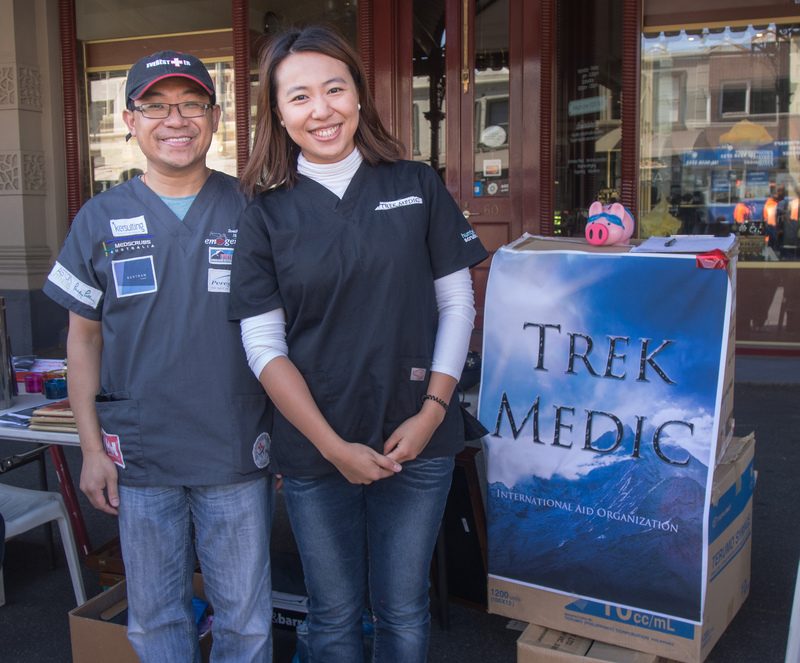 In 2012 Trek Medic had three teams of three to eight members each return to remote Nepalese villages with little access to health care. Those medicos’ campaign has now extended, with teams treating patients throughout Africa’s Kenya. Donations are not yet tax deductible, but gratefully received and 100 per cent utilised for top professional health care.